Crane Operator Certification Calgary - Crane Operator Certification is a process which permits people to earn a certificate to operate certain types of cranes. Certification includes hands-on practice, classroom learning and a competency assessment. Various training programs are available for overhead cranes, mobile cranes, boom trucks, tower cranes, forklifts and other hoisting machines. Trainees would know the fundamentals of equipment characteristics, safety, and operational practices related with these types of cranes. The on-site practical evaluation and training could be customized by each business after the in-class session. At any time, two operators will be trained by one instructor. The length of time required for training would differ depending on equipment type and the employees' levels of ability, but generally needs one to two hours. The training would focus on practical skills like right rigging practices, safe operating procedures and planning the lift. Employers must schedule the on-site session ahead of time. The training individual will receive an individual wallet certificate, whereas the company gets a wall certificate after completing the in-class instruction, practical operating instruction and assessment, and written test. To achieve certification, trainees should have an 80% passing score on both written and practical tests. 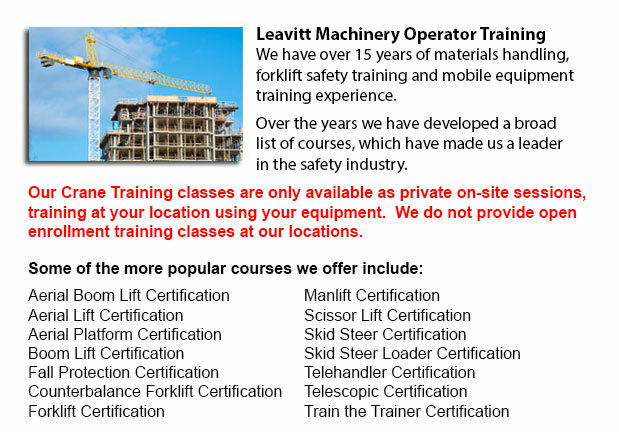 Included in the crane operator certification program is the following: Manuals, regulations and policies; safety issues; dangers of high voltage; emergency rescue procedures; signals and communications; terms, types and components; pre-operational check; crane configuration and capacity; pre-lift planning and set-up; hammerhead / luffing jib crane operations; wire rope and rigging; climbing cranes; fall protection; crane maintenance; CPR & First aid; and WHMIS. The minimum fundamentals for becoming an overhead crane operator comprise possessing the mental and physical capability considered necessary to be able to carry out crane work. Essential capabilities comprise normal field of vision, depth perception, reaction time, coordination and manual dexterity. Potential operators must not have the tendency to become dizzy. Operators who do not already have evidence of experience and qualifications should obtain certification. Operators should be qualified in order to operate the particular kind of machine which they would be utilizing to do their task.